I spent a really long day in the city yesterday, and I had a blast. But I was also so blistered and chafed by the end of it that I could barely move. That meant I cancelled my Mom Day today to sit around recovering. Was it worth it? You betcha. I took the ferry in with Adam in the morning; I’ve somehow managed to live here nearly 2 years without doing that. I’m not big on boats, but I took the ferry all the time when we lived in Hoboken. For some reason I just couldn’t get over the mental block of taking it from the Belford terminal up to Wall St. This is probably because of the horror stories Adam has regailed me with featuring heavy winds and total misery at sea on that same ferry. But it was an adventure, and I was fine. I had the world’s quickest doctor’s appointment, then I wandered for a few hours until lunch. I hit up Books of Wonder, my favorite children’s bookstore. I read a ton of new and new-to-me books, had a muffin at the Cupcake Cafe. Then I roamed up to The City Quilter and snagged some new fat quarters. Then it was lunch time. I met my friend Tracey, who works at NYU, at a Thai restaurant near her office called Cafe Tasia. It was cheap ($8 lunch special with app and entree) and good, but I’ve decided I’m too old for restaurants that are too cool to have comfortable seating. The community style tables had crazy benches wider than any human leg span, and they were too close together to pull them out to sit down. So I kind of had difficulty climbing into the seat, but once I was in it was very cool. But I’m not sure I’m cool enough or young enough to go there again. Maybe, that was some seriously good cheese and crab rangoon. I went to see Up after that, which I adored. I cried like crazy, it was a beautiful movie. And then the coolest part of my day came; I went with the NY Librarians Meetup to take a tour of The Strand. It was an awesome behind-the-scenes look at this institution, and we even met Fred Bass, the owner (that’s him in the photo). 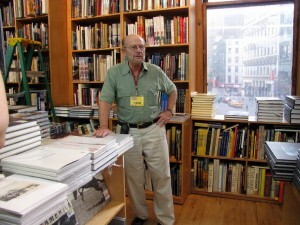 His father founded The Strand 82 years ago, and now he works there with his daughter. If you ever go in to sell used books, he’s probably sitting at that side desk buying them from you. In 2006, a popular Japanese columnist declared The Strand tote bag the #1 souvenir to bring back from NYC. Their sales tripled in a month, and they still have Japanese tourists coming in to buy them all the time. When it opened, The Strand was one of 48 bookstores down 4th Ave. It’s the only one that survived (they moved into their current location in 1956). Fred thinks this is because he was one of the only sons trained in the business. They are the only place in NYC that sells and rents books by the foot. So sometimes SNL calls them to rent books for certain scenes, like Hilary Clinton’s office (for example). Interior designers also call with requests for things like 100 feet of hot pink books of a certain height for a client. All the books in Meg Ryan’s store in You’ve Got Mail are borrowed from The Strand. All their author events are streamed live, and old ones are available to watch on their website. George F. Will gave them the famous “8 Mile” motto, but now they have more like 28 miles of books. So after all that, I went downtown to meet Adam, Laura Ann, and Dan for dinner at Red at Southstreet Seaport. Chili nachos, nomnomnom. It was a cool but completely exhausting day.